Big and Tall London’s Menswear is Ontario Canada’s most trusted independent retailer of big and tall men’s clothing. Established in 1994, London’s Big & Tall Menswear store boasts an extensive inventory of men’s big and tall clothing. If you’re looking to dress up, Big and Tall London’s Menswear has a wide selection of well-tailored suits and sport coats from top manufacturers in Canada including Jack Victor, Jean Paul Germaine, and S. Cohen. Big and Tall London’s Menswear will help you pair the suit with the best dress shirt from dress shirt makers including Modena, Cooper & Stewart, a handmade silk tie from Barbara Blank in New York City, or a tie-you-own bowtie! Big & Tall Menswear can even top it off with cufflinks, and dress shoes from Dunham Shoes, and you will be looking your best, no matter what the occasion is. On the casual side, London’s Big and Tall has a huge selection of jeans with top brands including 34 Heritage, Mavi, Summerfields, Wrangler, and Levis. London’s Big & Tall Menswear can help you pair the jeans with a sport shirt, look for brands like Luchiano Visconti, Cutter and Buck, Viyella, and FX Fusion, or a sweater (London’s big and tall has cashmere sweaters that would look great! ), or even a polo with brands like Callaway, Cutter and Buck, and Peter Millar. 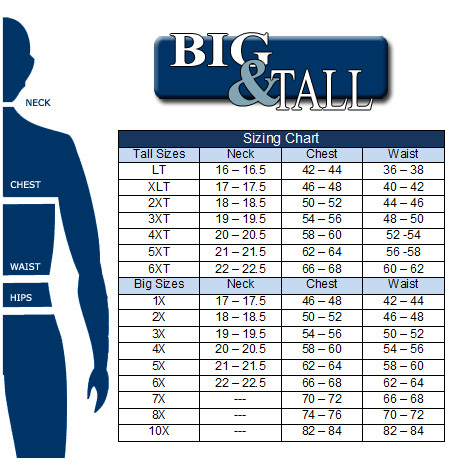 This makes Big and Tall London’s Menswear a perfect one stop shop for all your big and tall men’s clothing needs! London’s Big & Tall Menswear customers will find only the best quality designers at the Big & Tall Store and Online Store! Designers at London’s Big and Tall include: Callaway, 34 Heritage, Cutter and Buck, Luchiano Visconti, Savane, Ballin, FX Fusion, Summerfields, and 2205 Ink. New stock is constantly appearing in store and online, so be sure to log in or drop by the Big and Tall store for more details. If you’re coming to visit Big and Tall London’s Menswear in person, we’d love to meet & assist you! London’s Big and Tall Menswear is located at 2205 Wharncliffe Road South, London, Ontario. If you’re traveling on the 402, simply exit at Highway 4 (Exit 98 – Colonel Talbot Road) heading towards London/St. Thomas. Follow Colonel Talbot to Main Street. Turn right onto Main Street, which turns into Wharncliffe. Look for our big (and tall!) banners on your left hand side in less than one kilometer.